Back in January, I got bitten by the New Year's Resolution bug and decided to try jogging. It was one of those decisions made in a hasty blur of good intentions, and in stubborn denial of all existing evidence against it. Evidence like the fact that running makes me furious, and I hate it. Not to toot my own horn, but I actually stuck with it for about two weeks. What ended my short-lived attempt at fitness glory? I ran a full mile without stopping, promptly hurt my ankle, and limped my way back to the car, sweat dripping down into my sports bra along with my dreams of 13.1 stickers and social media self-congratulation. Running is best left to the experts, people like my handsome husband and Olympians. I'll stick to walking and the occasional yoga DVD. By the time I came to my senses, however, I'd already signed up for an Audible subscription. Audiobooks are expensive, after all, and not to hate on my beloved public library, but their audio collection at the moment consists mostly of CDs, to which all I can say is, holy antique technology, Batman. (Hey, the budget only goes so far. I get it.) Back when I pictured myself prancing merrily down the street several times a week, I thought audiobooks would be great because that way I wouldn't sacrifice any reading time. And they would have been, had I actually continued with my running plan past, I don't know, chapter three. So anyway, it took me two months to listen to How to be Black, but that's my fault, not the book's, because the book is hilarious and thought-provoking and challenging. Thurston is, among other things, a writer for The Onion, and he has the rare and valuable ability to be simultaneously entertaining and sharply observant. I laughed even as I cringed in recognition of my own biases and assumptions. 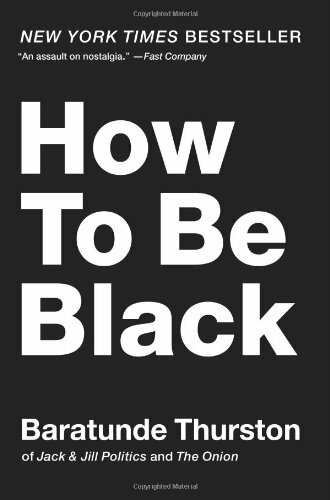 With chapter titles like “How Black Are You?” and “How to Be the Black Friend,” Thurston explores his own experience as a black man in America, but he also broadens the scope by interviewing a panel of other witty, insightful people. A perk of the audio version is that it's narrated by Thurston himself, plus the audio from his interviews is included, so we get to hear each person's answers in his or her own voice. That added a lot for me. It's clear from just a quick glance through my shelves that I don't read much non-fiction. When I do, I gravitate towards writing like this: personal, honest, funny, and illuminating. How to Be Black is a lot more than a book-length joke; it's humorous, sure, but it's also concrete proof that you can crack people up and make a point at the same time. My jogging experiment may have failed, but at least I got this book out of the deal.